You may have heard the terms “Cold Laser” or “Low-Level Laser Therapy (LLLT)” before. In general, such terms refer to “treatment using irradiation with light of low power intensity so that the effects are a response to the light and not due to heat.”1 Many of the terms used to commonly describe this process do not ideally reflect the mechanisms of action involved. They also don’t adequately distinguish this type of therapy from the other laser-based therapies that rely on heating tissue to achieve an effect. This lack of clarity has led to significant confusion and a need for better nomenclature. 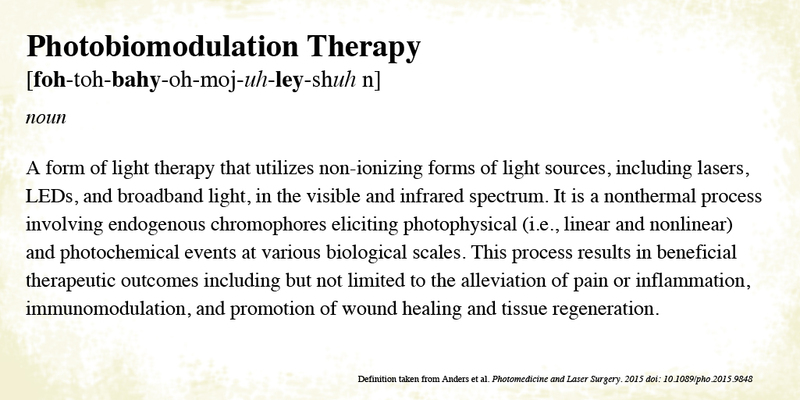 To learn more about the evolution of the term “Photobiomodulation Therapy”, please download this excerpt. 1. Ncbi.nlm.nih.gov. Low-Level Light Therapy – MeSH – NCBI. 2016. Available at: http://www.ncbi.nlm.nih.gov/mesh/?term=photobiomodulation. Accessed February 25, 2016. 2. Anders J, Lanzafame R, Arany P. Low-Level Light/Laser Therapy Versus Photobiomodulation Therapy. Photomedicine and Laser Surgery. 2015;33(4):183-184. doi:10.1089/pho.2015.9848. HOW CAN YOU COMPARE YOUR DEVICES TO LOW LEVEL LASER THERAPY – IT CLEARLY STATES NON THERMAL. AREN’T YOU A CLASS IV LASER?